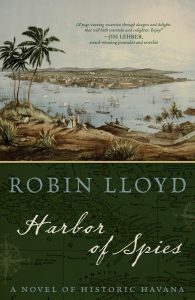 Harbor of Spies: a Novel of Historic Havana Harbor of Spies is an historical novel set in Havana in 1863 during the American Civil War, when the Spanish colonial city was alive with intrigue and war related espionage. The protagonist – a young American ship captain named Everett Townsend – is pulled into the war, not as a Naval officer, as he had once hoped, but as the captain of a blockade-running schooner. The rescue of a man outside Havana harbor sets in motion a plot where Townsend finds himself trapped by circumstances beyond his control. He soon realizes how this good deed has put his own life in danger, entangling him in a sensitive murder investigation. 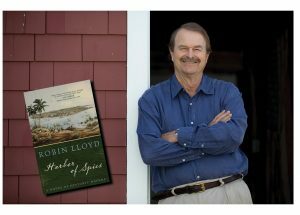 Robin Lloyd is a journalist and a novelist. He is the author of two novels, Rough Passage to London and Harbor of Spies. Lloyd has been involved in television journalism for more than forty years, working on camera as both a news reporter on the local and national level as well as a producer and writer off camera. A veteran correspondent for NBC News for nearly fifteen years, he filed reports from more than thirty countries, mostly in Latin America and Africa. He won an Overseas Press Award for his coverage of the wars in Central America and four regional Emmys for his documentary work as an independent news producer.